« Do You Believe in Miracles? Hello dear children, I trust you feel good about yourself! I just was thinking how much I enjoy coloring Mandalas! You know they call that adult coloring, but you would like it too! A MANDALA is an expression, which represents the cosmos. The COSMOS is the Universe which was Created by God. The colors of the Mandalas are my own inspired Creation. I always love to start from the center. I think of the center as the matrix, a source, the beginning of a Creation which spirals outward, to a perfect harmonious circular mandala. Working on that Creation, gives me time to meditate and think. Now let us think about God and His carefully thought out Creations. First He Created the Universe, the Sun and Moon, the Stars and Planets. The Earth’s name is Terra some call her Gaia, it is one of the smallest planets. All planets move around one another in perfect order, like a dance in the cosmos. God perfected the Earth’s lovely landscapes and life forms of all kinds. The animals, plants, the fish and other sea life, the birds and of course Us!!! When you notice the details of all that lives, you can imagine that took God a lot of thinking and planning! He created us so intricate, with possibilities of growing and re-growing! Also all other life forms. They can give birth and multiply. Just like humans give birth to babies. Look at the grass, you can cut it and it grows back! You cut your hair it grows back, and so do your nails, and skin. That took God a lot of planning. Even more special details for us! God made us to be able to feel emotions. Emotions like love and happiness, intuition, and knowledge. Because God loves us, and wants us to feel His love, to be close to Him. Think about some of God’s creatures, and life forms around us. Which ones you think are the mightiest of them?……. Ants are smart and well organized, they work together as a team. Honey Bees also work fantastically together in an organized social order. They also have for us painful “stinging” defense mechanism if we threaten them. So the smallest could at the end, defeat the largest. What about nature, the plants, crystals and flowers, they are growing and evolving with God’s Creative energy. See their beauty! Check how perfect flowers are shaped: all the details with petals and hearts. There are so many different kinds of all sorts of life forms around us. God Created “ALL THAT IS” with utmost care, for us to see, live and enjoy! Look at the yellow center of a daisy flower it has a natural form, patterned on 2 interlocking spirals. It is so awesome! Then each flower has a certain amount of petals and leaf structures. In the ocean the Nautilus and Ammonite shells, also perfectly shaped. Then see the design of our human inner ears! How we can hear! It looks like the inside of a shell. Our bodies are designed so intricately so as to function as our Earthly vehicle. We have to admire God’s precisian to Create such a body for our Soul to inhabit. Look yourself in the mirror, look at your eyes and love yourself as God is part of you! Above all realize your body’s structure. So much planning went into making that human form so functional. So take good care of it. Notice nature around you and take a deep breath. Thank God for air! It is essential for us to live. We need Oxygen in the fresh air! It goes from our lungs into the blood circulation to keep us well. We need water from fresh streams to keep hydrated. That means we have to care for the environment. Now think of it God made sure we had every thing for our life around us. All that we have need of, God started us with! Because all we needed was there at the time of Creation. God gave us charge over the plants, the seeds and the animals and to take care of the Earth! God just wants us to manage it well. And share! So nobody will be hungry. We have to plant, sow seeds and then reap, to process it, ready to eat. A lot goes into Creating and in the process we Co-Create with God! I know you will think the farmers do that, and we can buy the produce in the supermarket. That is OK just be mindful and give thanks for those who labor and provide! Give thanks to God for “Creating-Power” and for our life experience here on Terra. Where ever we are God is! Kids Corner - How often do you say "I AM?" Kids Corner #13 What You Believe - Creates Reality! 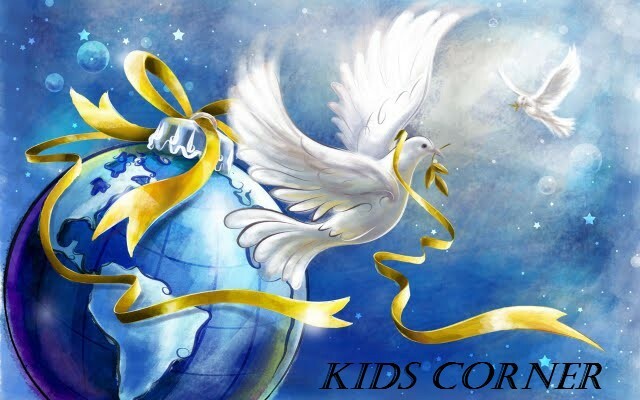 Kids Corner #10 You are your own judge... Did you know that kids? ?